I haven’t used the Windows operating system as my principle operating system for ten years. For a decade I have been using an iMac with its MacOS operating system and paying a premium for the privilege. I didn’t mind though. I just couldn’t stand Windows anymore. And since MacOS was basically written on top of UNIX, I could leverage my UNIX skills completely. My loathing of Windows though was not enough to keep me from buying a Windows laptop. I don’t use it much and given this I didn’t want to pay the premium for a Mac laptop. I formally left the Windows world about the time I retired in 2014, where using Windows 7 was required. My laptop came with Windows 10. The more I used Windows 10, the more I realized I liked it less than Windows 7. It’s so flashy and so terribly annoying. Amongst its many faults is that it will frequently update itself during booting it up, sometimes taking ten minutes or more before I could actually use it. There’s that and it feels so bloated with all the flashy controls, not to mention all the junk software that came installed. I’ve made it a goal to move off the Mac when I retire my iMac. The only alternative though seemed to be Windows. I couldn’t see myself going back to that. But maybe there was finally a distribution (“distro”) of Linux for the desktop that was finally mature enough to replace both Windows and MacOS? This led me to a little project to partition my laptop’s drive so I could at least boot up to another operating system rather than wait for Windows 10 to be usable. In case you haven’t heard, Linux is an operating system. Haven’t heard of it? If you have an Android-based smartphone, you are already using it. Google’s Android operating system is actually a wrapper around a minimized version of Linux. So if you’ve been thinking that Windows was the most popular operating system, you are wrong. It’s really Linux, hidden inside your Android smartphone. When Google created Android, it realized it was a completely different platform so the old constraints like “can I run Microsoft Office on it?” didn’t apply. They could build it properly and since Linux was already used on devices of all sorts (not to mention servers, where it predominates) they wrote a wrapper around free and open-source Linux and called it Android. So if you are looking at trends, you are realizing that Linux is taking over. It’s only lagging behind on the desktop. One reason Linux is lagging on the desktop is that there are so many variants (distros) of Linux. I picked one pretty much at random to place on a partition on my laptop: Ubuntu. Ubuntu is nice but it doesn’t behave like Windows. It also doesn’t behave like MacOS. If you are going to move to a Linux desktop, it should at least work similarly to what you are already using. It didn’t take me more than a week for me to say goodbye to Ubuntu. A friend recommended the Linux Mint distro saying it was written to be Windows-like. So I installed it and took it for a spin. One thing I noticed right away: Linux Mint booted up fast: really fast, at least compared with Windows 10. Windows 10 gave the illusion that you could use it right away but in fact it sort of hung after you logged in while all sorts of background programs tediously loaded. Mint though was quickly loaded and usable. And it had a Start-like button in the bottom left corner and task bar on the bottom just like Windows. Clicking on the button brought up a Windows-like navigation pane. Nice! But what was under the hood? Firefox came preinstalled, but also LibreOffice, an open source Office-like set of programs. I quickly learned that only the fussiest people would complain about these programs compared with Microsoft Office because probably less than 2% of us need the most advanced features of Office. LibreOffice is perfectly fine and you have to look hard to figure out what is different. Pretty much everything I needed was already installed, but there was a Software Manager off the “Start” button that made quick work of installing lots of other useful software. What wasn’t in the Software Manager was often available from various websites. If you download a Debian package (.deb files) from a website, Firefox will recognize it and it is quickly installed. Since there is usually a Debian package for programs written for Linux, this means that few programs Linux programs that are not available for Mint. While Mint comes with Firefox, if you love Chrome you can download that too. Only it’s not quite Chrome, but Chromium, basically the open-source version of Chrome. Google adds their own proprietary layers on top of Chromium to do things like make it friendlier with its services like GMail and call it Chrome. Since I do IT consulting, I didn’t have problems finding very familiar software I use every day. Filezilla is available for Mint. Since I couldn’t find a Debian package, I had to hunt for a RPM (RedHat Package Manager) package for XAMPP, a program that lets me install a local development environment for the web. This required some “hands on” work from the command prompt to install it, but it was the exception. Strangely, I hooked my wife, a Windows bigot who spurned my iMac. Her needs are modest: mostly Firefox, Thunderbird for email, VLC for playing videos and Steam for playing games. It turned out there was a Steam engine for Linux that was preinstalled on Mint, as well as Firefox, Thunderbird and VLC. She put it on a rebuilt laptop, throwing away Windows 10 entirely and replacing it with Linux Mint. Tomorrow she is off to Las Vegas to visit friends, and doubtless she will show off her laptop with its Windows-friendly Linux Mint OS on it. She loves it and is amazed by how quickly it boots and is usable. If you have to run Windows, you can run it virtually inside of Mint using WINE (a Windows emulator) which is also preinstalled. As for replacing my iMac, I don’t think there’s a way to run MacOS virtually inside of Linux. But there are Linux distros that try to emulate the Mac’s user interface. These include Elementary OS, Deepin Linux, Backslash Linux, Gmac Linux and Trenta OS. Of these, Gmac Linux looks the most Mac-like. 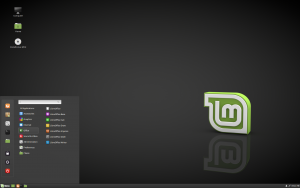 Playing with Linux Mint though has me thinking that it may kill off Windows. It behaves very similarly, is faster, more nimble, much more stable and doesn’t feel lethargic and bloated like Windows. Yet it’s also so familiar while feeling easier to use. Microsoft may be seeing the beginning of the end of Windows. To compete it may opt to turn Windows into a Linux distro, much like Android became a very unique distro of Linux for handheld devices. Or by being introduced to it through people like my wife, Windows users may discover Linux Mint and make the switch too.